We have been talking about accessible housing for thirty years, but I think our aging population will push us to get it done. Baby boomers have the money and influence to make things happen. They will demand something different. By the time I sit down to design a building or a house, I have already done a lot of homework. The needs of the end users direct my thinking. People who are aging or people with visual and other physical disabilities are topmost in my mind because they tend to be my clients. They influence me. To accommodate them, we need reasonably spaced accommodations, which is also often multi-generational. Working from the inside out as I do is called experiential architecture. Tom Parker, who helped coin the phrase FlexHousing™ in 1995 when he worked with Canada Mortgage and Housing Corporation, had comparable conclusions. FlexHousing™ is adaptable, accessible, and affordable. According to Tom: “FlexHousing™ is an award-winning concept and a viable alternative in today’s market.” Recently, CMHC has insisted as well on the need for healthy housing. The typical Canadian house is none of these things! We entered two submissions into the FlexHousing™ Design Competition: one for the single-detached housing and the other for the horizontal multiple housing. In both categories, we were the “Prairie Regional Winner” in Stage 1. Our single detached housing concept later received a National Award of Merit. The above floor plan drawings and 3D renderings show three phases of the FlexHouse™ design. As one of four winners across Canada, my design had to produce housing that could be easily adapted to meet the present and future needs of the occupants. As the competition booklet reasoned; “This adaptability will become increasingly important as our population ages. As lifestyle changes, and as we witness an increase in home-based activities and new technologies.” Our designs were cost effective while being both appealing and marketable to the consumer. As the winner in the Single Detached Housing Category, in the Competition, we explored ways we could most cost effectively build the project. I had already developed a working relationship with many of the non-profit organizations located in Edmonton, especially Habitat for Humanity – Edmonton. In time, we were able to put together a project construction team that included CMHC, Habitat for Humanity – Edmonton, and Ron Wickman Architect. The experience of working with Habitat for Humanity – Edmonton tested the flexibility of the FlexHouse™ design. Habitat for Humanity had their own dwelling design criteria: keeping space to a minimum. With the spirit of compromise and co-operation we were able to provide two different house designs that both satisfied the original intent of our FlexHouse™ design and those of Habitat for Humanity. This project promotes a more compact, affordable, and efficient city. Because it is located in the inner city close to a great variety of amenities, it encourages more pedestrian traffic and less automobile traffic by tapping into the city’s existing infrastructure. 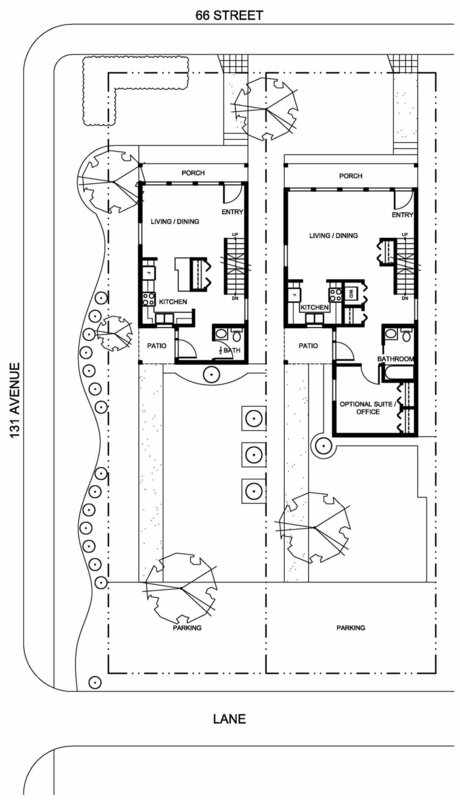 Located on a smaller lot, the design uses its land efficiently and effectively. This is sustainable design, as called for by the architects who participated in the 15th Venice Architectural Biennale, 2016. The above image shows the completed FlexHouses™ from the street. Stairs lead to the front doors of both homes. The existing underground service lines were not deep enough to lower the homes to create a no-step entrance. However, we had more space in the backyard to slope a sidewalk to the back door for a no-step entrance. The two completed houses identify a base two-story, three-bedroom dwelling with the potential for differing addition phases. The corner dwelling represents this base house design, while the mid-block dwelling represents a base house complete with a full bath and separate suite / home office on the main floor. Both houses can be expanded or added onto over time, as necessary, starting small and taking on future additional space for a variety of needs: teenagers, a home office, or a separate suite. Young couples with children, single parents, seniors, and persons with disabilities can also be accommodated in time. Designed to accommodate a variety of family types, the starter home, that in time can grow and even be subdivided, allows for an affordable dwelling to be purchased and later expanded to include additions that house office space, bedroom rentals, or garden suites. The project also has the potential to house one family, an extended family, or two separate families. The project is designed to function equally well on a mid-block or corner lot. The above image shows an exterior view of the homes facing the rear yard. The back entrance to the home on the left is visitable. The one on the right is not. The house on the left will never need money, time, or energy to create a no-step entrance. The gently sloping sidewalk to the back door eliminates the need for steps, providing easy access for persons in wheelchairs. The roof overhang on both houses protects residents and visitors from ice and rain. Both decks are room sized to facilitate future cost-efficient additions with their intact roof and foundations. The image beside shows an interior view of a second-floor bathroom. To accommodate a wheelchair, a five-foot turning space is provided; plywood backing is installed on the bathtub and toilet walls making it easier to install grab bars anywhere, in the future. Designed to simultaneously satisfy users with varying disabilities and of various ages, the project provides on-grade access, open floor plans, adjustable kitchen counters, lever door handles, adjustable closet rod and shelf heights, easy-to-grasp handrails. Rocker style switches installed at a lower height, have easier-to-reach outlet locations, which benefit those individuals in wheelchairs or using walkers. The project specified materials and building methods that promoted sustainable construction and healthy housing. The Habitat for Humanity job site is not a place for a designer with an ego. Everyone must focus on the needs of the families first. For me, working on this project was both humbling and emotionally rewarding. Whenever I watched the hundreds of volunteers, I felt that I was getting published or promoted. The volunteers were completely selfless. The project was special. The design was unique and innovative, and the construction process even more unusual with hundreds of volunteers visiting the site every day. The combination of these two made this project one of the greatest challenges I may ever face as an architect. I needed to be on site every day to ensure that the intent of the design was being adhered to. This process was incredibly time consuming while being intensely rewarding. The above image shows workers putting up a second-story exterior wall. The man at the back will become the eventual homeowner.